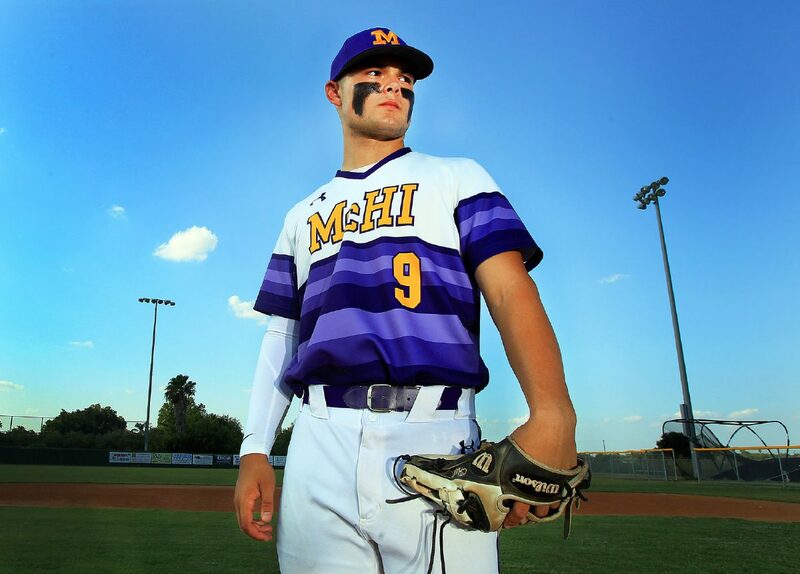 The Monitor's 2018 All-Area Player of the Year Aaron Nixon, McAllen High, poses at Vela High School on Wednesday, June 6, 2018, in Edinburg. 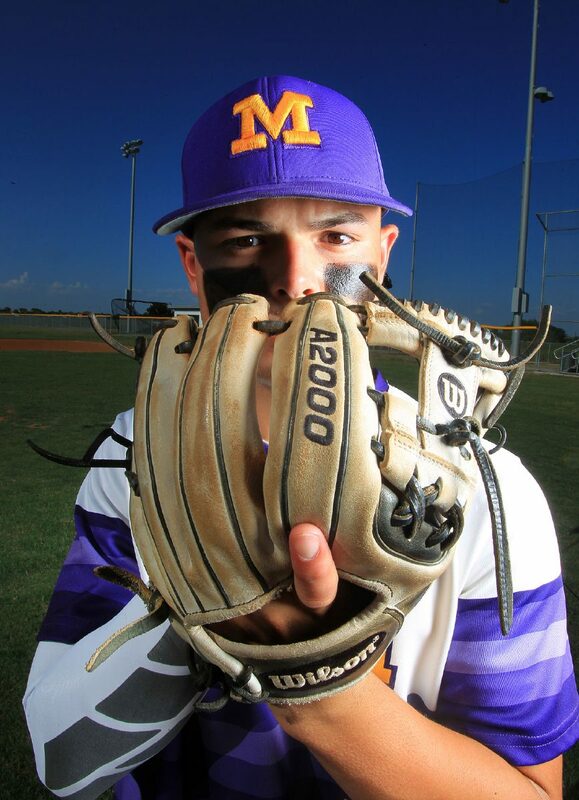 EDINBURG — McAllen High sophomore Aaron Nixon has never shied away from the spotlight, but he has never demanded it, either. Nixon was thrust into the public eye before he was done with middle school, when he committed to play baseball at the University of Texas. Since then the expectations and demands on him have grown year by year, yet he has continued to rise to the occasion. A move from third base to shortstop this year could have come with a learning curve, but instead Nixon put together his most spectacular season yet. He hit .441 with 41 runs, 31 RBIs, eight doubles, five triples and two homers. On the mound, he pitched 68.2 innings, posting a surreal 0.82 ERA with 104 strikeouts and just 15 walks allowed. For Nixon’s epic season at the dish, on the bump and at the most difficult defensive position, he is The Monitor’s 2018 All-Area Baseball Player of the Year. Nixon helped lead the Bulldogs on an undefeated run through District 30-6A before reaching the third round of the playoffs. The team was ranked No. 1 in the state by Texas High School Baseball. Nixon is a kid like the rest of his teammates. He enjoys memes and video games. But when he steps on the field, he is a man amongst boys, his patented eye black smeared across his cheeks, hiding a face that shows his youth. Last year, he didn’t get to start as a pitcher, instead focusing on hitting and defense. He dominated both, and earned more chances to pitch out of the bullpen. In the end, he was the one the Bulldogs turned to when they needed to preserve a lead late in playoff games. The enormous expectations that followed him into his freshman year grew after a stellar campaign. Flash forward to this year, and those even bigger expectations were exceeded once again. At this point the only question left about Nixon is how he can possibly keep improving. His drive to be better comes from his father, Beau. A marine veteran, Beau played baseball up until a shoulder injury took him out of the game. But he never stopped studying the game. Aaron’s love for the game came from his father. The two spent hours watching, talking about and playing baseball together as Aaron grew up. Anyone who watches a Bulldogs game will quickly spot Beau, tablet in hand, tracking all sorts of data, and squirming with agony or triumph after every pitch. When the two sit in the stands at a game at Aaron’s future home of UT, the conversations always revolve around the action on the field. Nixon’s future could be in pro ball someday, but he stays focused on the here and now, and if he doesn’t, his dad will pull him right back into the present. Still, that fun, loving kid that fans often forget is under the dirt-stained uniform and Bulldogs cap, has dreamed of the day he gets to throw up a “Hook ‘Em Horns” and toe the rubber for the biggest school in the state. And when it happens, you can bet Beau will be somewhere close to the dugout tormented by the nerves yet again.